Industrial process control often involves the management of fluid flow, either by simple on-off flow control, throttling, or diversion of flow to alternate destinations. 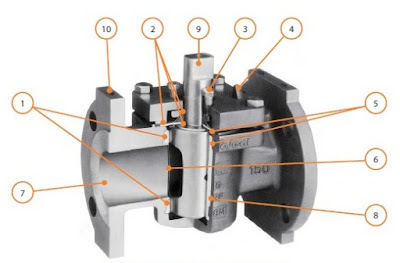 Valves of many differing designs and construction features provide distinct advantages for particular applications depending upon a variety of media characteristics, operational requirements, physical restrictions, and regulatory requirements. Plug valves, so named for the generally tapered or parallel sided structure held in the flow path by the valve body, have wide application throughout the fluid control field. Their advantageous features include simple design, low maintenance, moderate size, minimal flow resistance when fully open, and quarter turn operation. Drilled and tapped flange actuation mounting pads independent of cover and top sear assembly. Multiport configurations for flow diversion. Special cleaning, testing, production methods, or other specialized tasks needed to assure safety or performance under very specific application conditions found in various industries. An illustrated document with technical performance data for much of what is described above is included below. Browse the document for a more complete understanding of where sleeved plug valves can be applied and how they work. For more information, contact a valve specialist. Share your fluid control challenges with them and work toward a winning solution. The combination of your process expertise and their deep product application knowledge will yield good results.